All photographs on these pages are Copyright protected. They must not be saved or printed or altered in any manner. 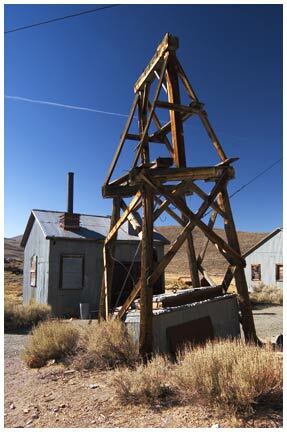 The town of Bodie in California was once a thriving gold mining town. At its peak, the population numbered 10,000. Today it is a fascinating remnant of an earlier time. It is one of my favorite locations for black & white film photography. Click for images of Bodie in black & white! The Standard Stamp mill. This mill dates to about 1900. 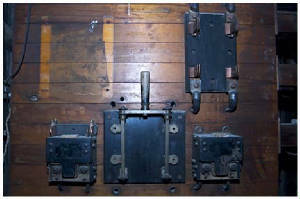 Tesla's original transformer in the Standard Mill. 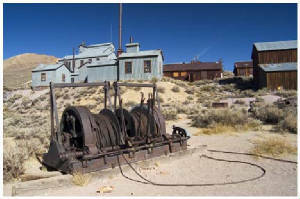 Electricity was brought to the Standard Stamp mill in November 1892. The power had to be delivered from a hydro electric power plant some 13 miles away. Long distance electrical delivery was a new concept for the world. The power lines to Bodie were installed in a straight line route. 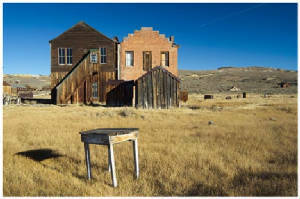 This was done because it was not known at the time if electricity would be able to round turns on the way to Bodie! Structure for the ore transport system. 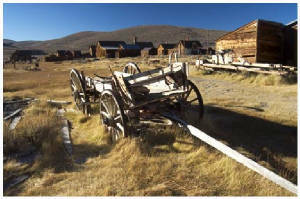 Click here for a comprehensive Bodie website. owned by Steve's Photographic Landscapes.